The Advanced Colour Analysis course is for image consultants who just have to know everything about colour – to improve your skills and knowledge, to become more confident, to be recognised as the go-to image expert. Tried-and-tested training that image consultants all around the world have previously enjoyed on DVD. We’ve converted the original content into an extra-special online version giving you instant access to the entire day of filming of a live event. For the first time videos in high definition, plus a plethora of additional training materials not available anywhere else. It’s packed to the rafters with new ways to diagnose colour directions plus oceans of marketing ideas to build your image consultancy too. The Fabulous Advanced Colour Analysis course isn’t for beginners. The clue’s in the title, it’s advanced stuff for image consultants who are looking for more! 23 different ways of doing a colour analysis, most of them without a drape in sight! Years ago I drove for almost two hours to an hotel to give a presentation on ‘The Power of Colour in Business’ to a select group of highly-influential business professionals. As I turned off the car ignition and glanced over at the passenger seat, I suddenly realised that I had forgotten my drapes. Normally, I strap the drapes stand into the front seat but, this time, it was decidedly empty. I was mortified and, for one horrible moment, I felt sick to my stomach. I just couldn’t believe that I had actually spent two whole hours on the road without noticing the missing drapes! My saving grace is having the ability to ‘wing it’ and behave as though everything is absolutely fine. So I set up my presentation and, as is my usual custom, started introducing myself to all the guests. By the time I was ready to begin my talk I had acquired, amongst other things, a bright yellow jacket from one lady, two pairs of red shoes, 4 or 5 different coloured handbags, briefcases, a plethora of coloured ties from some extremely helpful gentlemen, and a variety of coloured napkins from the hotel. That day, I learned that you don’t need a set of drapes to demonstrate the power of colour, even if the room is full of incredibly successful high-flying business owners. After all, they hadn’t a clue that I had planned to use any drapes in the first place! That day, I learned a lot more about what customers actually want from a presentation rather than what I thought they would expect. That experience started me on a lifelong quest of finding alternative ways of demonstrating colour analysis. You see, I totally believe that there’s far more to colour analysis than just the drapes. I am totally prepared and ready to analyse anyone’s colours at the drop of a hat using my own personal ‘in the back of your head’ method and use whatever props are to hand. So on this course you will learn how you can do exactly the same. I’m going to show you 23+ different ways of diagnosing your client’s colouring, some with drapes, and some without. I’m also going to show you how to make so much more of your colour and communication skills, and share my own tried-and-tested marketing methods with you too. Learn from home at your own pace, and expand your colour knowledge, improve your customer service, attract new clients, and work over and over again with your existing clients too. 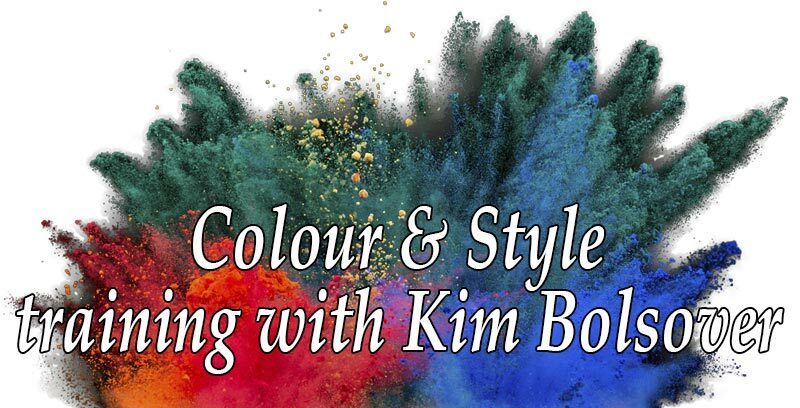 Become the go-to colour expert that everyone recommends with my Advanced Colour Analysis course. Masses of comprehensive course notes. The Course Training Manual contains 6 sets of notes, one for each of the six course parts. Each set is a chronological list of my notes plus key points raised by the 10 image consultants who were on the live training course. How to diagnose your client’s colour direction using 23 colour analysis techniques that actually work and 8 that we debunked as nothing more than urban myths; for instance, the daft idea that only those with warm colouring can have freckles. What nonsense! Does your client have a clue what you’re talking about? These extra training materials will help you understand more about how to communicate effectively with every type of client who walks through your door. After all, if she doesn’t ‘get’ what you’re telling her, you’re both wasting your time! On its own, this is worth more than the investment in this course! Used by image consultants I’ve trained around the world. I’ve expanded my original 4-page Tonal Taster script to a full 17 pages detailing a fabulously easy-to-learn, easy-to-apply technique which will bring you so many more clients. This is my SECRET marketing method and is exactly what I’ve used to kick-start my image consultancy on numerous occasions! After learning from loads of mistakes myself over the years, you can now use my personal checklist for running any workshop or presentation, whether it’s for 4 or 400 people. Establish your status as a colour expert and use Munsell to explain when your clients ask about the whys and wherefores of the colour consultation. My super-special Colour Analysis Quiz is included too! When you get your clients involved discovering their own colour direction, it’s a dead cert that they’ll do a lot more with the rest of the advice that you give them. We filmed the entire live Advanced Colour Analysis Training Day with 10 fabulous consultants and produced the training program which you can purchase here today. We really thought we’d have to edit out quite a lot of chit-chat but we found we had an entire day of incredibly high-quality training, questions, answers, comments, hints and tips. So we’ve left it all there for you to enjoy. Over 4.5 hours of incredible training. Lots of invaluable information, questions, answers, hints and tips, together with over 175 pages of comprehensive online ready-to-print course notes, including all the questions, and all the answers too! Watch part #4 of the course with my compliments. It shows actual consultations on real people using a number of the 23 different ways of doing colour analysis including piecing together the evidence, using neutrals, style personalities, and face masks. How to making sure your client understands what you’re talking about! If you’ve been struggling to fathom out which drapes to use, or finding that you’re confusing your client (or yourself) in a colour consultation, we look at an amazing array of different methods, tips and techniques to help you improve and refine the way you diagnose cool vs. warm, dominant tonal characteristic, and a full seasonal/tonal analysis. I share lots of my secrets on how to identify the different characteristics quickly. Some of them will challenge your thinking, and some will give you that “Oh, yes, I can see it now!” a-ha moment. Over the last 35+ years, I’ve learned what works for me and what doesn’t. I’ve also discovered what works for other successful image consultants, even if I can’t work that way myself. I share what I know with you so that you can choose the methods that work for you, so that you will become more confident with your own colour analysis skills. Does your colour consultation client have a clue what you’re talking about? You could know everything on the planet that there is to know about colour analysis but if you can’t get what you know across to your client in a way that they understand, then your knowledge is about as useful as a chocolate teapot. Being a professional image consultant means knowing how to communicate effectively with every single type of client. On this course you’ll first learn about your own personal learning style and how to recognise those clients who learn just like you. then you’ll learn how to work just as effectively with clients who learn in a completely different way from you too. There’s not much point sharing all the amazing knowledge and advice you have with your client if she can’t see what on earth you’re talking about! It has to make sense to her, as well as to you. A happy client who totally gets what you and she have discussed will tell all her friends about the fantastic experience she has had with you and your client numbers will grow and grow. It’s fine being a world expert in colour analysis but it’s about as useful as a chocolate teapot if you don’t have any clients. I’ve spent decades doing it both the wrong and the right way and finally fathomed out what makes a successful and profitable image consultancy. I’ve invested thousands of pounds and zillions of hours learning what brings in new clients and how to work with existing clients over and over again to help them develop into fabulously confident women. Every single question raised before and during the live training day has been filmed and captured on for your delectation, compiled in a Q & A portfolio, an invaluable boost for your confidence in your own abilities. Gosh, I wish I’d had the chance to go on a course like this when I was starting out all those hundreds of years ago. I’d have saved so much time and money! I’d have been able to ask all those daft questions that niggled away at me for years and years. I’d have built a bigger, more successful, more profitable image consultancy a lot sooner. After completing your Advanced Colour Analysis training course, you’ll find it so much easier to find new clients, develop existing clients, and build your image consultancy, all because you’ll be so much more confident about what you’re actually doing! Over 100 pages of course notes from the live training event, with every conversation, question, answer, hint and tip captured! New and exclusive to Improvability-trained image consultants and personal stylists – lifetime membership of our exclusive private FaceBook group ‘In the Pink’, to positively support and inspire each other 24/7 to create a truly successful colour, style and image consultancy. 6 months of personal email support – ask me all your questions. I went on a course which was very pricey and I lerant nothing. Then I purchased your Advanced Colour Analysis course and I’m taking the time to listen and learn from your workshop. You are very good at delivering a presentation and confident… and perhaps having bags of life experiences helps to build that confidence. People will listen to you as you come across very gentle, humble and a good listener. There’s a lot I can learn from you. I like your style. Thanks so much for your tips, you really boosted my confidence and you showed me what really needed to be covered in my colour consultations. My last consultation was brilliant fun and a great experience – my client was totally thrilled and I was very glad to have the chance to go for it! Thank you again. I have just completed your Advanced Colour Analysis course which I found incredibly useful, especially the marketing! Would you make a good Image Consultant? A quick and easy way to navigate your way through the plethora of mini-courses, training with certification, and customised business training options for image consultants. Whether it’s for personal interest, or to become an image consultant, or to build and develop your image business, there’s something here for you!